You can earn 119 yards with this purchase! 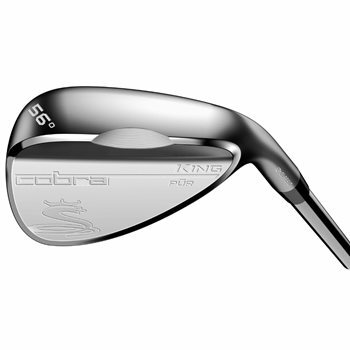 The Cobra King Pur wedge has a new design that features Progressive Spin Technology to provide more consistent trajectory through wedge lofts and Notch Technology that allows the sole and trailing edge to sit lower to the ground at address on square open-face shots. The 100% CNC milled face and grooves allow for consistent spin across the entire face and delivers optimized roughness to maximize spin and control for more precision shots around the green. The raw 304 stainless steel finish improves spin performance with a softer feeling grain structure while diffusing sunlight to reduce glare. Classic grind wedges have classic lofts, thinner soles and higher bounce to give you greater performance for a wide range of conditions.